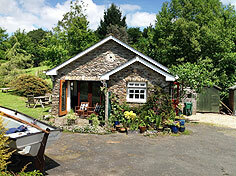 Homefield Garden Flat offers charming self catering accommodation on the edge of Aveton Gifford. This cosy holiday home sleeps up to 2 people, perfect for a romantic break away. This is a great base for exploring a range of famous attractions in Devon. Aveton Gifford sits on the River Avon, or Aune, that flows from the Avon Dam on Dartmoor down to Bantham Beach and Burgh Island. You can enjoy various walk along the Devon lanes and footpaths. Activities in the local area include sailing, kayaking and golfing. The South Devon Coastal Path is reachable by car. In nearby Salcombe you can visit Overbecks Museum and Garden. There are also lots of amazing gardens to explore here, making for an interesting and varied day out with the kids.